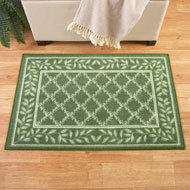 These beautiful rugs feature a twotone lattice design in the center surrounded by leaf borders. 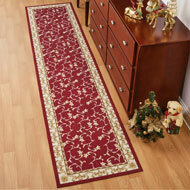 Perfect for protecting your floors in high traffic areas or over your carpeting to keep it clean and prevent wear. Skidresistant backing. Available in 3 sizes and colors. Spot clean. Latex and polyester; imported. Choose Chocolate, Burgundy or Sage. Sizes available in 24" x 36", 26" x 60" or 26" x 120" (Not shown). 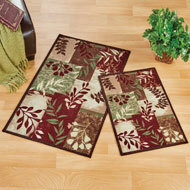 Protect your floors and add style to your home with these accent rugs. 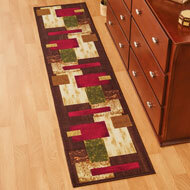 Richlycolored leaves in ivory, sage, chocolate and burgundy. Hand wash. Sold individually.  Nylon and latex with skidresistant backings; imported. Choose: 20" x 30" or 27" x 45". 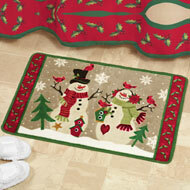 Celebrate the season with this fun and festive rug. 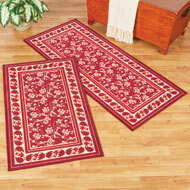 Colorful rug features a snow couple providing a cozy resting place for bright cardinals on a snowy day. Perfect all winter long, the sides have laser cut edging details on a burgundy border. Skidresistant backing. Machine wash. Acrylic, latex and polyester; imported. 32"L x 20"W.
Protect your floors while adding bold, geometric style to your home with these attractive rugs that feature a lovely design and plenty of style. 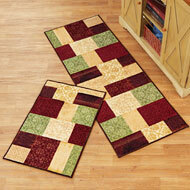 Each rug features richlycolored shapes in shades of burgundy, green tan and beige, surrounded by chocolate brown borders. Hand wash. Sold individually. Nylon and latex with skidresistant backing; imported. Choose: 27" x 45" or 20" x 90".